Our Model 901 has been used to test for residual oxygen in argon flushed glove boxes, giving the user the ability to draw sample from inside the box. A Model 905V oxygen analyzer is being used to measure O2 produced from the decomposition of hydrogen peroxide. Our Model 901 has been used to test for residual oxygen between the panes of sealed, argon flushed windows. A fragrant type of oil is packaged in a glass bottle with a lid consisting of a hard outer shell, and a soft inner lining. Total headspace available is approximately 5mL. Our R&D team developed a special procedure that allows us to successfully access the headspace content of the bottle. Using our Model 905V, we can get an oxygen reading with as little as 0.5mL of headspace. Household name shipbuilder using our Model 906 analyzers for welding application; we calibrated their analyzers to an exacting standard with argon as their background gas. 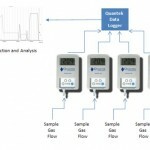 A major energy company recently installed four Model 200 oxygen analyzers, connected to a single data logger, to analyze and collect oxygen concentrations from four distinct gas streams.